Java course is designed to train the candidates on windows & web based application development in Java environment. This course provides the firm foundation in objective oriented programming, methods etc. Training is been conducted by the Real Time Experts from IT Industry. They teach the latest trends like java enterprise edition, data structures in java and many more important topics. The main motto of this training is to enhance the learner’s skills from beginner level to advanced level. 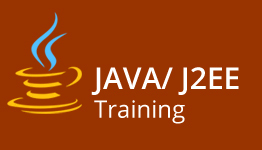 Course Objectives: Soon after the successful completion of this Java course the learners would get thorough in the following concepts: Learners will get to know all the aspects of Java Development courses like core Java, Advanced Java, Servlets, Structs etc. Our trainer’s team covers all the concepts from Basic level to advanced frameworks. The learner can develop the Enterprise Application, Web application and the product development using Java Technology. One can even build the interface to perform read and write operations of data from the Database. Candidates with minimum programming language skills and who desires to seek a career in Development can opt this course. One should possess good analytical and logical skills to master this programming language. It is not necessary that the learner should possess the programming skills in prior but if at all they have it is an added advantage. How to declare a Java Classes? How to declare Attributes, Methods? Constructors and Different types of constructors? How to Develop a View component? How to Configure & Deploy the Servlets? How to Develop A Controller Component? To Develop the Controller Servlets? How to Develop Dynamic Forms? How to Develop JSP Pages? How to Develop Jsp pages by using custom tags? How long is the Java course? The course is been divided in to different modules like core java, Advanced Java, Hibernates etc.. So the duration of the course depends on the module which the learner has chosen. No as of now we don’t avail this service, but in the mere future the learners can expect this service. Could you please let us know what could be the system requirements to make Java available in Windows-OS? Browser : Internet Explorer 9 , Firefox, Chrome.